01324 628 202 | Take a look inside the shop! 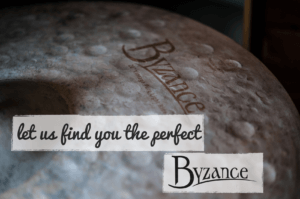 Meinl Byzance handpicked by us. The past couple weeks have been totally buzzin’. And today… mental! So I thought I’d finish Friday with a wee post full of information on this Sundays upcoming spectacular! 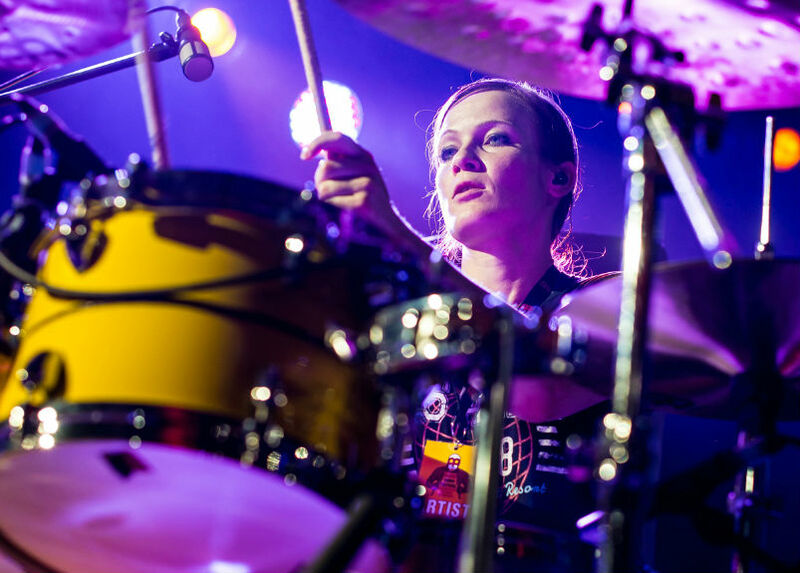 Anika Nilles will be at Meinl Day Scotland! Had quite a few calls regarding whether she’d be attending this special edition of our Scottish Drum Festival. This will be Anika’s only UK date for 2017. And it’s happening because – despite having to cancel dates before and after ours due to a couple medical procedures to repair a drumming-related injury – she insisted on joining us for the day. How great is that? And as much as I’d like to say I was responsible, that’s not the case. Anika made that decision, so massive thanks to her. I’m also really buzzin’ about our original co-headliner, Michael Schack, because he’s a dynamo who will absolutely shake things up. A top clinician who tours the world, Michael is surely the hippest and most exciting groove-rocker ever on an electro kit… a total blast…and blaster. If you’re looking to be surprised… he’s slamming one minute, funky the next, with wicked fills. My head’s spinnin’ already because Reports from Canada’s International Drum Fest in Quebec said he was ‘the surprise that kept on surprising’. Michael is gonna kick it! Seeing the brilliant Miguel Lamas, Spain’s hot prog-fusion rising star blew me away. Wow! We had to have him. So he’s our ‘rocket in the pocket’ player… the talent deserving wider recognition. We like to feature new names because surprises are a big part of our mission. And Miguel will be a very, very pleasant surprise. We’ve also got the most excellent Jim Drummond, whose credits include Runrig’s Donnie Munro, Rock Band Strangeways, The Paul Rose Band and resident drummer spot at the Jazz Bar in Edinburgh. Jim is the one of Scotland’s most loved Drummers, i’ve had so many requests to put him on at a drum show – as well as being a massive fan of the Man and his playing to bits! It’s a brilliant line-up covering everything from rock and funk to jazz and fusion. Some will be groove, some will be solo, but anticipate some mind-melting moments too. Best of All it will be Music. If not I hope to see You on Sunday! We at Meinl are very happy to be a part of this special Meinl Day Scotland produced by David Dowell and his team from dD Drums. Our participation is an opportunity to thank those Scottish drummers who support Meinl, but also to all drummers and other musicians who attend. Live music lives in 2017 because of players who dare to pick up an instrument and challenge themselves. So Meinl Day Scotland is for all the players. Because of them, real music is alive and well north of the border. Hopefully this special day will inspire everyone to continue to pursue their musical mission. Meinl have been amazin’. Same with D’Addario (UK). Our usual sponsors have been tied down with two major events south of the border, so Meinl stepped up to ensure Scotland’s drummers have their annual show. As a sign of appreciation, we are happy to call it Meinl Day Scotland in their honour. As for the drummers who play our shows, they love it here. It’s like how major touring bands love playing Scotland. Anyone who has seen gigs at the Barrowlands, Apollo, Usher Hall, the Playhouse, Caird Hall in Dundee, the Alhambra in Dunfermline will know that Scottish audience are the best. Imagine AC/DC at the Barrowlands in the 70s and what absolute magic that would have been! Or Benny Greb or Richard Spaven or Ian Matthews or Steve White at the Scottish Drum Festival. We show them a great time and a whole lotta respect and they return the vibe. It’s all about the love. Y’know, the past few months of putting the festival together I’ve been busy with dD Drums, Scotland’s Funkiest Wee Drum Shop, teaching at our studio, hanging out with my girls, rehearsing and now playing an Elvis theatre production and… hey, I don’t know how many other things. There are times when I’m not sure where I am. But my mates – you know who you are – and all of you excited about the festival are powering me. I’m diggin’ the energy and the vibe coming from everyone. I just want you to know that it’s people that power the festival. And you’re those people. I’m also very happy Norbert will be coming in from Germany with Anika, while one of the Music Industry’s leading marketers, Wayne Blanchard has come all the way from Canada, and Ben Alldred, of distribution giant D’Addario (UK) will also join us. They are avid supporters of dD Drums and our festival. I’d like you to meet them because they represent what is great about the Music Industry. So, they’ll be there, I’ll be there, the dD Drum Studio teachers will be there, as will their students. And we’re looking forward to the drummers of Scotland being there too. This event is for them. And ‘them’ is you. Without your support it doesn’t happen. With your support it does. It’s your event. I’ll see you at the show. Kaz Rodriguez at dD Drums! dD Drums have been supporting the needs of drummers since 2001. We’re geeky about gear, passionate about education and we love throwing events for drummers. If you’re in to drums, then you’ve come to the right place. Subscribe to our newsletter and we’ll keep you up to date with everything that goes on at dD.